Today is bright and will be warm and I sit and munch half a bran muffin washed down with a decaf coffee on the train to New York City while I listen to a young couple dote over their three-year old boy, he’s a cute kid in a baseball cap who stands on the seat and marvels at everything, looking around in wonder and asks questions, lots of questions. There is three young girls sitting diagonally across from me speaking French, I am shy to go and talk to them I don’t want to make a fool of myself, but I push shyness aside and walk over asking if they were from France, which they confirm. I excitedly talk about my love for France and everything French, my ambition to cook French food and to be a tour guide in NYC and to someday ex-pat to France after Mom and Dad are gone and Chris is moved to Vegas or Canada whichever he chooses. They are here for five months and are doing work/study programs although they don’t seem to want to share the details or even talk that much too me. The dark-haired girl is friendly and the redhead too I guess, but the mousey girl sitting closest to me looks petrified or at least uncomfortable. They assure me that they are meeting friends who live in the city and will not need my services but I explain that I am not licensed yet so cannot guide them anyway, although I could do it for free… that is not illegal in New York but give them time. So I decide to wish them well and head back to my seat and they talk amongst themselves, laughing occasionally at the older guy who just wanted to meet some people from France, but now I feel like a fool who should have kept his mouth shut. When will I ever learn. I know I have a tendency to be too excited when I talk about my passions, but I’m not the only one and I remember Drew Barrymore, the actress talking on Late Night about how she scares people with her enthusiasm for a new project, so I can really identify with her, I guess I do too but at least I’m in good company. So I get out at Penn Station and make my way to the blue A,C,E subway line and check my old tickets for credit left on rides, I swipe my old cards and see that I have plenty. While doing so the three girls come up behind me and are busily engaged in trying to use the ticket machine, I say a quick hello again but don’t even try to help them, I would have helped them in any way I could just to be nice. But their snobbery being what was I move off quickly to get the next train to West 4th St station and make sure I’m in a forward car so I don’t run into them again. It’s a quick ride on the subway, whoosh! and your there almost before you know it, I get out and almost immediately I am asked for help by a woman and her daughters from Queens who are looking for the Washington Arch and NYU University, I whip out my flip map and tell them to follow me and we walk up to the 8 Th Ave exit. It’s a beautiful day turning warm as I lead them to the Arch, they walk fast and it’s hard for me too keep up, I’m guessing they are looking at the school for the girls to attend after they graduate high school and after we walk past the fountain, still dry. Not in operation yet as I see excited kids running around inside its shallow bowl that will soon be cooling off visitors who brave the (clean?) water to cool off in the heat. I part company with the family on the other side of the park pointing out the NYU buildings to my left and with a few Thank You’s they are off to see the wizard and I go to towards the Lower East Side starting point for my tour. I am stopped on my way by a young Asian girl who is lost, looking for an address. She is staring right at a map mounted inside a frame for the students looking for certain buildings in the area but this girl cannot find it and she cannot be late, she’s going for an audition! I tell her to follow me and I tell her also that I’m a tour guide in training and it can be very confusing especially with all the construction going on with closed streets and all. We walk a few blocks and a few turns later and I’m beginning to think I screwed this girl up but she turns to her left and says “Here it is!” with glee and with a shake of my hand we wish each other good luck and I continue on my merry way, the triumph of making a difference for two people putting a swagger in my step as I continue on my way. I give a homeless man the other half on my Bran muffin and says God Bless You as I pass him by and a little further on I see a youngish couple looking around in confusion so I stop to help. They are also from France and I tell them how much I love their country and using my flip map show them exactly how to get to the West 4th St Station, and also what train to take to get to 42nd St which is where they want to go next, they also thank me profusely and with smiling “Au Revoir’s!” they move off and I holster my map like a smoking gun in its holster ready for the next time. My starting point is a few blocks away but I am in need of nourishment now and I spot an old-looking place just ahead. I stop in the Cafe Colonial, a Brazilian eatery with a brunch menu and a simple atmosphere with white metal bistro tables and chairs, and a pay phone in the back corner. I order a simple meal of warm steak over field greens and a decaf coffee and after a wash up in the loo begin to make notes on the trip so far, I feel a real optimism about today as my food arrives and that is made more apparent by the delicious food I get. This is the way I should eat at home, no starches just meat and greens with a little whole grain thrown in too. So I pay the bill and start walking down the street when I see a familiar face standing in chefs gear smoking a cigarette, I don’t know his name but I recognize his face from the food network Iron Chef show, he was one of the contestants to be the next Iron Chef! I stop and say “Hey I know you from the food network!” “That’s right, that was me.” he says casually but visibly happy to be recognized. I look at the building , “Is this where your working now?” I ask not being able to see the sign up ahead. “Yeah. you should come in and eat, it’s the best!” But I explain I just ate at Cafe Colonial and he suggests I get a paper menu, so I move off to do so and them after I get it I can’t resist going back and saying “Dude can I be a real tourist and have you sign this?” as I offer a permanent marker and the menu. He signs it without hesitation and I explain that I’m studying to be a tour guide and will be back to eat here the next time I come to the Bowery to study and eat. I shake hands agin and start walking towards the starting point again. This is shaping up to be a great day! I might just have made my first contact in New York! 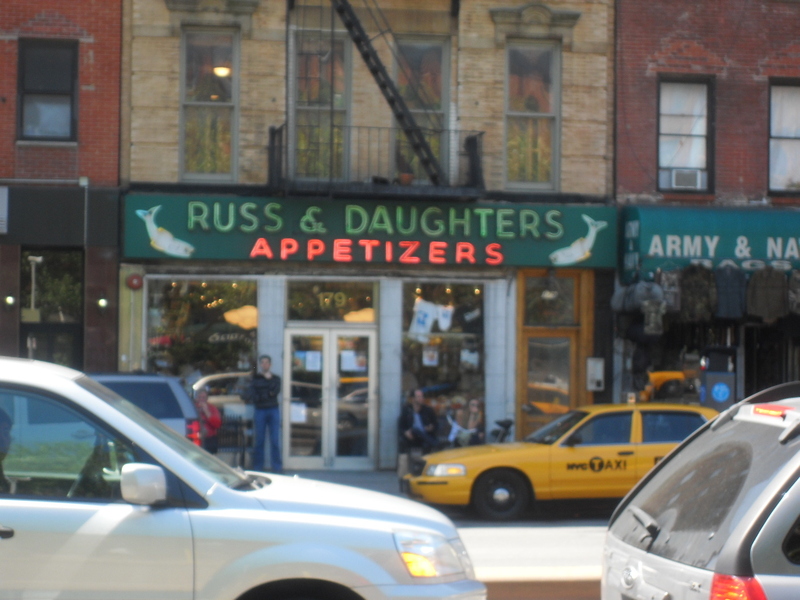 Best place for a bagel and a smear in New York City! So I begin my tour stopping first at the Famous Russ & Daughters Deli appetizers since 1914, it is said to have the best bagels, Nova & Caviar cream cheese in New York, it is packed so I walk down and back getting glimpses of fantastic food in flashes as the space between bodies is small and closes quickly, people are ordering bagels by the bagfull! I leave promising myself that I will have a bagel next time around, next I take a few minutes to photograph the famous Katz’s Deli, I wish I was hungry because this place serves up beef brisket or pastrami sandwiches that need their own Zip Code! I peeked in once at this place at night right before the Anya Marina show in 2008, (see Anya Marina Concert Parts 1&2) but didn’t want to eat so much as this place gives you between two slices of bread. I move off turning on Norfolk and take it down to Rivington & Orchard, but needing a loo I stop in Nooy’s Bar for a cold beer but first a wash up, this is actually the bar for the Kampuchea restaurant, a mix of Cambodian and French Cusine I find out from the young friendly bartender who is cutting and squeezing dozens of limes to fill a Magnum for drink-making. I sip my cold Hennepin Ale and we talk the interesting menu, travels abroad and N.Y.C. He is a Californian studying graphic design who works 50 hours a week and pays $1200 a month for a studio apartment! I find him a great source of info for food and wine, he has re-done the drink menu for the restaurant himself and added his own spin to them. He is smart, friendly, hipster, cool and I admire his ability to multitask and still be a great conversationalist. I can’t resist ordering the Chicken Rillettes and another beer, they come with small greens and pickled Rhubarb with toasted slices of Baguette. It is superb, I needed this so bad! I haven’t been this relaxed and happy in a long while. I could sit here all afternoon, but I can’t eat or drink anymore. I pay the tab and shake my bartenders hand and thank him for his kindness and move on. I walk down the street taking it all in, the sun, the breeze, the easy feeling of being able to do whatever I want with no one telling me what to do or where to stand while I do it. I move through Chinatown and enter another world where I am the minority and don’t speak the language. I sit on a low wall on the corner of Bowery & Canal St and write, cool from the breeze yet warm from the sun. I watch the kids play on a clay soccer field while parents sit on benches and talk on the sidelines. The little park is surrounded on two sides by a grass field about ten feet wide where a young woman sleeps peacefully with a cell phone on her chest while a young hipster lies on his back with his knees up talking on his phone a few yards away. I realize how lucky I am to have a piece of land I can call my own, this is all the nature they get in this urban sprawl of concrete, stone, and the ever-present sound of traffic and machinery. It makes me appreciate the ease with which I walk out my back door and step into nature. I move on into the heart of Chinatown where stalls of fresh fish (some still flipping around) crowd the sidewalks that flow with the runoff of melting ice in a constant stream to the street. The foods here are endless, dried mushrooms, dried fish, and strange vegetables are displayed and in butchers windows whole roasted Peking Ducks and chickens. The crowd is a mix of tourists but mostly natives that live in this enclave and shop here all their lives, vendors hawk their wares and shoppers argue loudly over prices and freshness, at least that’s what I think they’re saying but who knows. The bucket of still moving blue crabs from some far off place the subject of this particular debate. I pass into Little Italy and the mix of Chinese and Italian turns all Italian as I make my way up Elizabeth St where I see a familiar figure sitting outside his butcher shop, Moe is still going strong at 83, he sits with his son enjoying a Perrier water and enjoys the day. I promise to come back and get a “Got Cha Steak” his trademark aged beef steaks as soon as i fix or replace my grill. Well, the tour was done a while back on Grand Street and now I am back on the corner of East Houston Street and Elizabeth Street, the Cafe Colonial is a few steps away, across the street is a big mural on the wall of a building painted with the cities permission by Shepard Fairey of Obey giant fame ( see What is Obey Giant Parts 1,2,3,&4 for more) the last time he was in New York, right next to that is Billy’s Antiques and Props. My brother and I have plans to cook over the open fire tonight so I better head back to Penn Station, I walk towards 6Th Ave as the strong late afternoon sun burns a little as I pass familiar sights, the basketball park and street vendors on West Houston and easily find my way back to the West 4Th Street subway station. It’s an easy ride to Penn and easily grab an express train to Hicksville, three stops to home! I sit on the train and think about what might have happened if I had a camera crew with me shooting my fun day. Somehow I think it’s just possible that I too could have a hit show on the Travel Channel, so what if I’m not tall dark and handsome. I don’t have to be a hipster twenty-something with a face full of scruff and a half tucked shirt with vest. I can just be who I am in all my aging hipster, latter-day bohemian, over enthusiastic glory! Those French girls missed out, they could have spent the day with me being shown the ropes, while listening to a good storyteller who knows a few good places to eat and drink. It was a great day nonetheless, and I managed to make a difference for a few people who let me into their life for a few minutes, all in a days work for The Guide Boheme.